Studies of older iPads have shown us how light from devices affects circadian rhythms. But despite being smaller, the new iPhone X makes more light than old iPads did. The new OLED screen has a high-powered green color, and both blue and green move into the “melanopic” region of the spectrum that tells your body it’s daytime. Apple’s screen is now taller and bigger than it feels: it makes twice as much light as an iPhone 6, even more than the “plus” models do. iPhone X makes 20% more melanopic light when visually identical. When we talk about how light affects the body, it’s important to measure both spectrum and intensity. While people say that “blue light” affects the circadian system, it’s actually “blue-green” light that matters. Melanopsin senses light that looks cyan, and so it has blue and green in it. Some kinds of green matter more than others. OLED screens make more saturated greens by moving the green primary from 540nm over to about 524nm, which may sound like a small change, but the shape of that green also gets narrower, and so a lot more of it winds up in the range that affects melanopsin, more of it than did before. One way to write down this spectral impact is to measure the M/P ratio, or the number of (non-visual) “Melanopic lux” per (visual) “Photopic lux”. The idea is that you can make two lights that look exactly the same to your color vision system, but which affect melanopsin differently. Most LEDs fall within a small M/P range, but OLED has a larger impact. Using some numbers, the iPhone 6 gives an M/P ratio of 0.93, and the iPhone X has an M/P ratio of 1.13. So when you’re seeing exactly the same colors on an iPhone X, they are making 20% more stimulating light, and you can’t see this–the difference is invisible. This OLED multiplier persists when we change the color temperature: iPhone 6 at 2700K has M/P ratio of 0.47, and the iPhone X at 2700K has M/P ratio of 0.57 (or 20% more). If you want to make the impact “per lux” the same as an iPhone 6, you’d have to pull down the color temperature of an OLED screen to 5000K on the newer screen. But spectrum is not the whole story (it’s not even a majority of it). The new iPhone X has a larger screen area because it is quite a bit taller, and you might not think this would matter very much. But consider that a taller screen doesn’t make you hold your phone farther away–your arms are the same size, the width of the screen is very similar, and your minimum focusing distance doesn’t change. If you hold this screen at about the same distance (and it feels about the same “size” as the older phones), the amount of light is a lot more, almost double. This effect is enhanced by the ability of this screen to give off light in all directions–it lacks the directionality of an LED. LED-based screens have a very rapid fall-off as you tilt the screen, so you might have made a habit of tilting the screen a bit to dim it, pointing your phone up a bit while reading. OLED has much less of this falloff–it is considerably more uniform, like a piece of paper. But you can no longer tilt the phone to dim it quite so much, and actually, the edges of the screen will be somewhat brighter than before. This means that the “edges” of the screen deliver more photons to your eyes, and this difference was a big change in our measurements, enough that we had to change our model to account for it. When the increase in screen size and change in directionality is considered, the iPhone X at the same measured “brightness” (luminance or cd/m²) can deliver nearly double the light to your eye that the old screen can. The new screen can dim more. Compared to the iPhone 6, it can get to below half the previous measurement (1.6 cd/m² vs about 4), and Apple has hidden the Automatic Brightness toggle in iOS 11, which makes it harder to turn off. Our advice is to try your best to leave it on. The good news is that these new screens are capable of getting dimmer at night, and the hidden settings will make it more difficult to have a fully-bright screen late at night, which for most people is a good thing. If you don’t dim (which you should) and you use a 9” viewing distance, this new screen can make >110 melanopic lux at the eye, and our survey of screen users says that some people hold the screen even closer than that. Those with presbyopia (at 18”) will still have a screen capable of 35 melanopic lux, which is still quite a lot. The iPad 1 studied by Harvard Medical School researchers measured 30-50 melanopic lux at the eye. That screen had a large impact on sleep, shifting the clock of the participants by 90 minutes in one night. Most iPhone X users will be seeing more light than that, unless they make sure to dim the screen quite a bit. On a screen this bright and effective at delivering bright light to the eye, the mild “Night Shift” settings Apple provides just don’t have much impact. Night Shift’s default setting is not capable of dialing things back to the level of the old phones with Night Shift turned off. 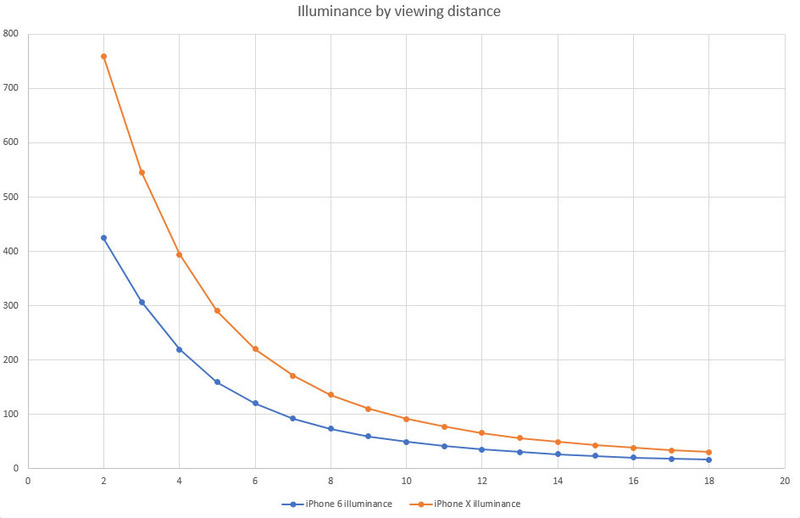 Compared to previous phones, with the screen the same brightness (luminance), your eyes will see twice as many melanopic-weighted photons as you would on an iPhone 6 (20% from the spectrum, and nearly double from the geometry and directionality). Let’s be clear: this screen is now well beyond the range of early iPads to delay sleep. It’s not a “little” screen anymore, and it’s very good at making light that your non-visual photoreceptors will see. To avoid increased sleep and circadian disruption, you will need to dim this screen more, use inverted dark modes whenever possible, and most importantly, keep automatic brightness on. If you can learn to, hold the new phone even farther away. As a common-sense test, if a screen is lighting up your face (or your child’s face), it is too bright, and you should dim it more. And mostly, try to turn it off well before bedtime.